TLG specialises in the removal of concrete gutters (also called Finlock Gutters), and replacement with an attractive and high quality seamless aluminium guttering system. All our fittings are made from the highest quality materials and come with a ten year guarantee. The fascia boards and fittings we use from Eurocell have a factory direct guarantee of 20 years. We can fit this system on properties ranging from freestanding, semi-detached houses to mid-terraces, even if the property currently has no downpipes, due to our patented joint fittings. We can also install the TLG gutter cleaning system, which reduces the hassle of gutter upkeep through the minimisation of moss and leave build up, which can result in inconvenient blockages. Contact us today to talk to one of our experts and find out how new gutters can transform your home. We also replace flat roofs and insulate conservatory roofs using our specialist team in this area. Please contact us for more information on the process. We have been thinking about removing out awful concrete gutters for years as it was causing damp patches inside the house. However its was expensive and the people we had talked to before did not instil confidence. Spoke to Tony (MD) of TLG Gutters who really knew his stuff, he as really happy to answer questions and also give advice. He came to do a site inspection a couple of weeks after we called him and we decided to go ahead. We had some discussions of if we need additional ventilation, however as we had a permeable roof membrane we did not. He arranged the Skip & Scaffold and it all arrived in the morning. Two of his guys worked all day to do the back, then we had really bad weather the next day so they came back the day after to do the front. It was still windy but they persevered. All done now, I went up to scaffold to install a new security lights and had a chance to see the work close up. It was super neat, all the joins (which were kept to a minimum) were true and neat, all the holes were filled. 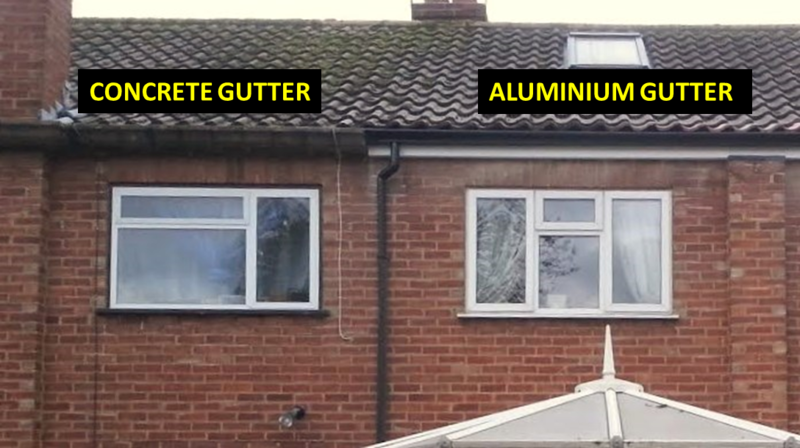 The new Gutter itself is extruded aluminium and is a single piece. The fascia boards make the whole thing look like its always been there. Its a lot of money, but I think its totally worth it as the concrete would only have got worse, I actually looked at the old guttering in the skip and I could see exactly where the previous lining attempts with epoxy and tar are failed due to movement in the blocks and ice formation. Many thanks, great job. We have recently had our old concrete gutters removed and I can highly recommend the company we chose, TLG Gutters who are based in Derby. From our first contact with the company it was clear that Tony was extremely knowledgeable about all aspects of the job requirements which gave us a great deal of confidence in him and his team and I'm pleased to confirm that our impression proved to be absolutely correct when they completed the job on time and to a very high standard. An excellent job done by an excellent company at a competitive price. 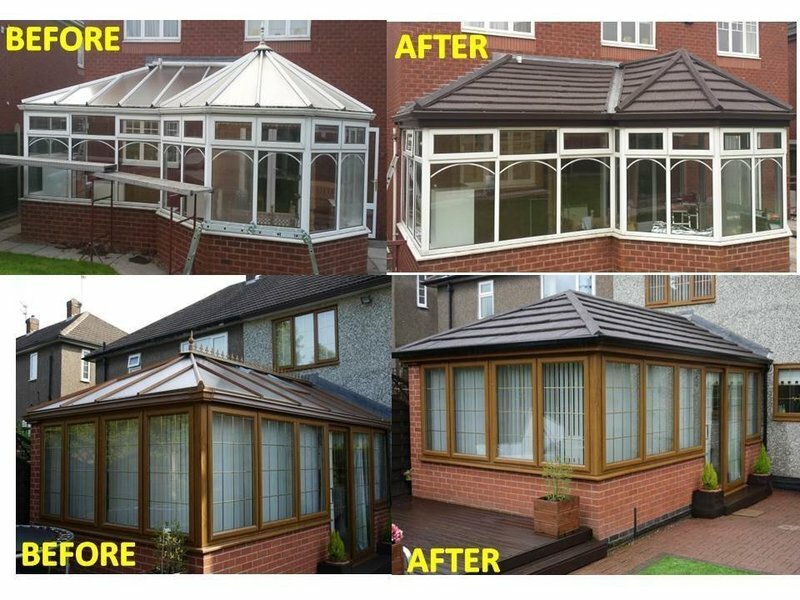 New roof to conservatory. Everything to budget. Workmen very workman like, very helpful. Everything done to a professional standard. Team worked extremely well together, and the work was carried out to a very high standard both promptly and efficiently. I would have no problem in recommending them. The men worked hard. The job was done efficiently and speedily. They cleared up well on completion. When finished the guttering looked. Invoice was as agreed. Installers were polite and the works were completed in two days. Site was kept clean and tidy. All stages of the works were explained to us and products were shown to us at out initial meeting. All round a great job and a great team. From start to finish I cannot speak highly enough of this company. They were excellent in their workmanship, the workmen were a credit to the company. We are very pleased with the end product. Excellent job, prompt and professional. An excellent job from start to finish good price and design for the job. Black gutters as suggested an excellent choice as smart and clean. The workmen did a fantastic job, going out of their way to complete on time, even clearing a wasps nest. I highly recommend the product and service from this company 10/10!